Thomas Main interviewed me for this book, and I enjoyed our conversation. Main did not represent himself as anything but a critic of White Nationalism, but I found his questions to be stimulating and looked forward to reading the final product. Although it is hard to pin down Main’s politics, The Rise of the Alt-Right has a strong neoconservative flavor. He devotes a great deal of energy to a hairsplitting defense of the Jeffersonian civil religion of universal human equality based on the Declaration of Independence, which smacks of Straussianism, especially the Harry Jaffa school. Hilariously, Main accuses White Nationalists of “radical Gnosticism” (p. 7), which struck me as a bizarre dog whistle to the even tinier Right-wing sect of Eric Voegelin’s readers. Main’s ethnic background is Irish, but his wife is Jewish. Based on his style of writing, I would guess that he was an undergraduate in philosophy at a Jesuit University. He teaches in the Austin W. Marxe School of Public and International Affairs at Baruch College in New York City. His publisher, the Brookings Institution, is centrist and establishmentarian. The book bears blurbs from Mark Lilla, who strikes me as a Straussian who has decided to forgo the painful double life of pretending to be a conservative—and Heidi Beirich of the Southern Poverty Law Center. Perhaps the safest thing to say about Main’s perspective is that he is not Right-wing or Left-wing. He is simply establishment, extreme establishment. The Rise of the Alt-Right gets off to a promising start. In chapter one, “The Emergence of the Alt-Right,” Main defines his terms and introduces his cast of characters. In addition to reading, Main did interviews with Peter Brimelow, John Derbyshire, Mike Enoch, Brad Griffin, Kevin MacDonald, Richard Spencer, Jared Taylor, and me. In his discussion of intellectual progenitors of the Alt-Right, he focuses primarily upon Sam Francis, Paul Gottfried, Kevin MacDonald, and Michael Levin. Main regards the Alt-Right as “far more radical and dangerous than the right-wing extremism of past decades” because of its “underlying ideology” (p. 4). He thinks that White Nationalists today are “intellectually and rhetorically sophisticated”—but only “relative to neo-Nazis or Ku Klux Klan supporters” (p. 7). By his own standards, he judges Alt-Right thought to be “abysmal”—but he saves that judgment for much later, because if he put it up front, most readers would not commit the time necessary to slog through his book. Main distills four distinctive features of Alt-Right thought: (1) “A rejection of liberal democracy,” which he identifies with the principle that “All men are created equal.” (2) “White racialism,” which he insists on identifying with white supremacism. (3) “Anti-Americanism,” because we believe that our race should command a higher loyalty than our nation. (4) “Vitriolic rhetoric.” “The movement rejects the standards ethics of controversy and indulges in race-baiting, coarse ethnic humor, prejudicial stereotyping, vituperative criticism, and the flaunting of extremist symbols” (p. 8). This last point, of course, is a very poor fit for Taylor, Brimelow, Derbyshire, and most of the other figures Main discusses. This is just one more reason to finally bury the Alt-Right “brand,” which is dead and getting stinky. I simply refer to myself as a White Nationalist. 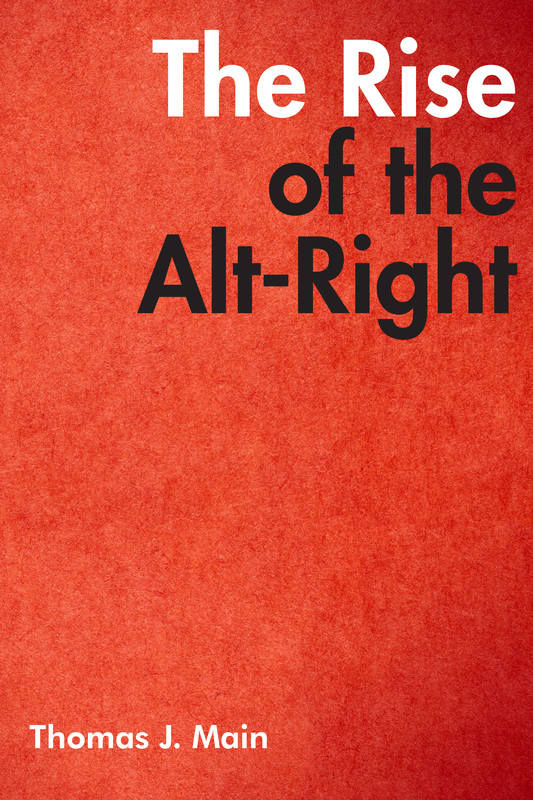 In chapter three, “From Right-Wing Extremism to the Postpaleos,” Main deals with Samuel Francis, Paul Gottfried, Kevin MacDonald, and Michael Levin as the intellectual founders of the Alt Right. Main also focuses primarily on Francis’ adaptation of James Burnham’s analysis of the managerial elite, particularly as expressed in his Leviathan and Its Enemies, which Main labels “the most comprehensive statement of Alt-Right thought” (p. 35). This is a laughable claim, given that Leviathan and Its Enemies was completed in 1995, its author died in 2005, the book was only published in 2016, and I doubt that even a dozen people have read it since then. I have not read it, and I was a great admirer of Sam Francis. I started reading Francis while I was in graduate school, and I met and conversed with him half-a-dozen times between 2001 and his death in 2005. I valued his work as a political commentator and essayist, but when he started talking about Burnham, I tended to tune him out. It just sounded too Marxist. Based on conversations with Jared Taylor and other friends and close collaborators of Francis, it is my impression most of them felt the same way. In short, Francis’ analysis of Burnham was the least influential part of this thought, and Leviathan and Its Enemies had no influence on the Alt Right, which was conceived long before the book was published. Main’s emphasis on Francis and Gottfried makes sense given that Richard Spencer emerged from the paleoconservative context. It also makes sense if Main views the Alt-Right through neoconservative lenses, since paleoconservativism was a reaction to neoconservatism. But if Main wanted to understand the thinkers who most influenced the movement’s criticisms of liberal democracy, he should have asked. I’d love to know what Brimelow, Derbyshire, Taylor, etc. would say. In my case, Louis-Ferdinand Céline’s Journey to the End of Night, Thomas Sowell’s A Conflict of Visions, Alasdair MacIntyre’s After Virtue, Nietzsche’s Untimely Meditation “On the Advantage and Disadvantage of History for Life,” Matthew Arnold’s Culture and Anarchy, Plato’s Republic, Kojève’s Introduction to the Reading of Hegel, and some miscellaneous essays by Roger Scruton were decisive. Francis and Gottfried were not formative influences, but I found them useful thinkers. I know Brad Griffin would name MacIntyre’s After Virtue as an influence as well. Most of the younger people on the Alt-Right, however, are not “postpaleos” but “postlibertarians,” and I suspect that with this population Hans-Hermann Hoppe had many times the influence of Sam Francis. Main’s treatment of Kevin MacDonald is also somewhat risible. In The Culture of Critique, Kevin MacDonald argues that Jewish intellectual movements like Marxism, Boasian anthropology, psychoanalysis, the Frankfurt School, and the promotion of multiculturalism and open borders should be seen as tools of Jewish ethnic warfare against white societies. The question of the extent to which these theories are true is really immaterial to MacDonald’s analysis. Ideas don’t need to be false to be tools in ethnic conflicts. MacDonald, of course, makes it very clear that questions of truth and questions of motives are very different things. A person with bad motives can make true claims. A true theory can be used for evil purposes. Ideas can only be verified or falsified by reference to reality, not the roles they play in ethnic power struggles. This is true of Marxism, Boasianism, and MacDonald’s work as well. MacDonald does believe that the Jewish intellectual movements he critiques do, in fact, offer false theories and specious arguments. He also believes that his own work stands up to objective tests. On the next page, Main offers this howler: “So, in legitimating the hunt for ‘deeper reasons’ behind his adversaries’ arguments, all MacDonald has done is stipulate that motivations are indeed relevant to the question of whether one is ‘right’ and that therefore, given his admitted hostility, he is probably wrong” (p. 73). Of course, MacDonald’s position is that questions of truth and questions of motives are different. Beyond that, MacDonald makes clear that his negative conclusions about Jews came at the conclusion of his investigations. They were not there at the beginning. But even if MacDonald were biased against Jews from the start, the sole criterion for determining the truth or falsehood of his views is their correspondence to objective reality. Main asks how intellectual movements can become influential if they are bogus. Surely they need to be at least plausible. This is true. And surely academic peer review would weed out patently false ideas. Main paints a laughable picture of academia as a place in which the disinterested pursuit of truth trumps all political concerns. Elsewhere in the book, he appeals to the “consensus” of impartial scientific researchers who deny that race is a meaningful biological category (p. 178) and that racial differences in intelligence are primarily due to nature, not nurture (p. 179) and who affirm that mankind is causing global warming (p. 178). Nobody here but us disinterested pursuers of truth! Main, of course, knows better, since he himself is in academia; since he is surely aware of the voluminous neoconservative literature attacking (certain kinds of) political correctness; and since elsewhere in the book he praises gatekeepers who used to prevent radical Right-wing ideas from being expressed. The reason why Jewish intellectual movements flourish despite offering bogus theories is that they are practiced in slowly taking over institutions until they are in the position to brainwash the impressionable and marginalize their critics. But wherever they cannot do this, their influence fades. For instance, Freudianism has almost no influence in mainstream psychology, but it does persist in psychoanalytic institutes that Freudians control and humanities programs that lack rigorous standards of truth. Main devotes a large chunk of The Rise of the Alt-Right to pious quibbles about the Declaration of Independence. He wants to elevate Jefferson’s line that “all men are created equal” into a civil religion and the outermost boundary of permissible political debate in America. That means that White Nationalists need to be suppressed and censored. Never mind that the Declaration is not a legal document of the United States. And do we really have to believe that men were created to be part of polite society in Thomas Main’s America? I would wager that most of the promoters of Jeffersonian civil religion today are atheists. What Main thinks we cannot be allowed to deny is that all men have the same rights to life, liberty, and the pursuit of happiness. For Main, the belief that rights are universal immediately entails a multiracial civic nationalism. But not so fast. I believe that all people have rights to life, liberty, and the pursuit of happiness. But that does not entail that we should all live in the same community. Racial and ethnic diversity in the same society is still a bad idea, even if one believes that all men have rights. I made this point in my interview with Main, which he quotes on page 205. But he does not seem to grasp the challenge it presents his argument. Indeed, if all men have the right to the pursuit of happiness, shouldn’t that oblige us to look into how racial and ethnic diversity impact happiness? In “What’s Wrong with Diversity? ” I cite several scientific studies that indicate that racially and ethnically homogeneous societies are happier. Main’s discussion of my work is disappointing. He describes Counter-Currents as a “digital colloquium for the Alt-Right’s best minds,” but boils our conversation down to “two distinctive characteristics: antidemocratic radicalism and implausibility” (p. 109). He writes that “Johnson’s rhetoric is relatively mild, and he often condemns violence, but otherwise the extremism of his thought is hard to overstate” (p. 109). For example, to my remark that just as the New Left learns from the Old Left, the New Right can learn from the Old Right, Main fairly explodes, “These sentiments are not only wild-eyed extremism, they are preposterous to boot. The catastrophic failure of Mussolini’s and Hitler’s movements, even from the perspective of their own bellicose nationalism, is obvious. [Would they have failed if the Allies had not started a world war to stop them?] Anyone who thinks that ‘many things of permanent value’ were achieved by these two mass-murdering incompetents casts grave doubt on his or her own competency, to say the least” (p. 110). To my position on the Jewish question, Main says that “its absurdity . . . is obscured by its gross anti-Semitism.” Of course it is rather question-begging to object that a frankly anti-Semitic argument is . . . anti-Semitic, but let that slide. Let’s focus on the absurdity charge. Main says that my desire for Jews to live in their own homeland, not the United States, is absurd because why don’t I want to repatriate “Americans of English, Swedish, and Irish ethnicity” as well? The answer, of course, is that the American people is an amalgam of assimilated European stocks, but Jews remain a distinct people with a record of promoting their group interests at the expense of the larger American community. But if Swedish Americans had remained aloof from the rest of the US population; if they had a pattern of promoting destructive ideologies and cultural trends; and if they made a pattern of subverting American foreign policy in the service of their homeland’s ancient grudges against the Russians and the Finns, I would of course support repatriating them as seditious aliens. Main concludes his book on a sinister note with a long and sinuous palaver that basically amounts to an argument for censoring people who reject racial egalitarianism. He does not come out explicitly in favor of government censorship. But he does praise the failed gatekeepers of the conservative movement, and presumably he would have no problem with censorship by gigantic private corporations like Google, Facebook, Apple, and Amazon.com. When an academic ends 254 pages of analysis and critique with the words, “The task facing democratic polities now is devising technologies and institutions that re-empower the gatekeepers whose position has recently been undercut without lapsing into mere censorship. How important is this task? About as important as the recognition that all people are created equal” (p. 254), I take it as an admission of intellectual bankruptcy. I can’t recommend The Rise of the Alt-Right to anyone besides the people who were interviewed for it. They will find it an intensely annoying read, but wrestling with some of Main’s criticisms will help us make stronger arguments in the future. 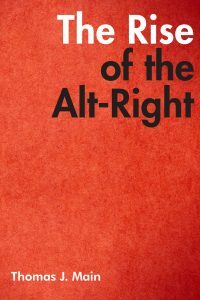 Those who are looking for a comprehensive study of the Alt Right should read George Hawley’s Making Sense of the Alt-Right , which is not only far less tendentious but far more accurate as well. The Rise of the Alt-Right is riddled with mistakes. For instance, on page 35 we are told that the National Policy Institute was founded by Richard Spencer. On page 64, H. L. Mencken’s name is spelled “Menken.” On page 104, we read that the original Alternative Right webzine was founded in 2012. Counter-Currents is referred to as Cross-Currents on pages 128, 195, and 205—although it is referred to correctly elsewhere in the book. On page 171, The Occidental Observer is called Occidental Review. On page 201, a quote from someone named Albert Jackson is attributed to me. On page 219, Evola’s Men Among the Ruins is called Man Among the Ruins and said to be Evola’s last book. And these are just the errors I marked. Also, I did not check Main’s voluminous end notes. On page 140, Main comments on passages from Thomas Jefferson’s writings indicating that Jefferson believed that blacks were more emotional and less attractive than whites: “Jefferson was, of course, wrong, and reading these comments is very disheartening to modern admirers of Jefferson.” Regarding Jefferson’s remarks about “merciless Indian savages” who exterminate men, women, and children, Main writes that they are “unfortunate” (p. 142). (The remarks, not the massacres.) On page 144, Main condemns Jefferson’s idea of returning slaves to Africa as “an utterly wrongheaded, unrealistic, and immoral judgment.” Why, exactly, is it immoral to return forcibly displaced peoples to their homelands? The poor old sod. Surely he knows better. How can he write such things and still feel good about himself? But such opinions are required by the American civil religion to which Main zealously subscribes, namely the proposition that all men are created equal. For my part, at least, truth is a higher value than equality.